If you have recently been refused an Australian visa, and disagree with the decision, there are some steps you can take. Information below may help you to generally better understand your options. Has your visa been refused or cancelled? The role of the Migration and Refugee Division of the AAT is to review decisions made by the Department of Immigration and Border Protection (DIBP). The AAT have the power to affirm, vary or set aside DIBP’s decision, or to return the matter to DIBP for reconsideration with specific directions. The AAT is able to consider a wide range of visa-related decisions, including refusals and cancellations. Decisions are based on the merits of each particular case. Your application for review MUST be lodged with the AAT within the required time frame. The letter that you receive from DIBP regarding the decision to refuse or cancel your visa will refer to the exact time frame within which you must lodge your review application, should you take this step. In most cases the relevant time frame for application is 21 days from the date of a decision to refuse a visa application, and 7 days from the date of a decision to cancel your visa. set aside DIBP’s decision, meaning that the decision will be changed. In this situation, the AAT has the option of substituting DIBP’s decision with a new decision, or returning the matter to DIBP for reconsideration (see below). remit DIBP’s decision, meaning that the matter will be returned to DIBP for reconsideration. The AAT may then give DIBP directions that it must take into account when reconsidering its decision. You MAY qualify for a bridging visa upon lodgement of your review application. The type of bridging visa that you qualify for (if any), along with the conditions of that visa, will depend upon your circumstances at the time that you lodged the visa application that is under review (if the review relates to a refusal decision). Please note that it may take up to several months for the AAT to complete its assessment of your application and make a decision, depending upon the amount of material that it must consider, and the complexity of your case. Merits review of immigration decisions has been available since 1982 through the Immigration Review Panel. That panel was created by executive action and was replaced by the legislatively established Immigration Review Tribunal (the IRT) in 1989, later renamed the Migration Review Tribunal (the MRT) on 1 July 1999, to become part of the Administrative Appeals Tribunal (AAT) on 1 July 2015. The former Refugee Review Tribunal (RRT) established in 1993 also merged with the AAT on 1 July 2015 in its Migration and Refugee Division, and reviews decisions in relation to applications for refugee status and refugee protection visas. In addition, the Immigration Assessment Authority (IAA) was created in April 2015, as a separate office within the Refugee Review Tribunal (RRT), which from 1 July 2015 also became an independent authority within the AAT. Limited appeals lie from both the AAT to the Federal Court. The former Migration Review Tribunal (MRT) and Refugee Review Tribunal (RRT), now form part of the AAT, which has primary jurisdiction to provide merits review of specified decisions made under the Migration Act and Regulations. The Administrative Appeals Tribunal (AAT) reviews migration decisions on their merits. The tribunals’ task is to make the “correct and preferable” decision in the particular case before it. This is a much wider task than that of a judicial review court, which is concerned only with whether a legal error occurred in the making of the decision under review. In contrast, merits review is concerned with remaking the decision under review (‘standing in the same shoes’), not with correcting errors made by the original decision maker. Merits review tribunals decide all questions of fact and discretion for themselves. They can consider any evidence that will help them come to the correct and preferable decision, including evidence that the applicant failed to put before the original decision maker. In light of that new evidence, they can substitute their own findings of fact-even if the original decision maker’s findings were “correct” on the basis of the evidence available at the time. Further, even if the tribunal does not identify any errors of fact (or law) in the original decision, they may substitute their own judgment of how any discretion should be exercised in order to come to the preferable decision. The tribunals can also form their own views as to the desirability of applying departmental policy in a particular case. These tribunals’ factual and discretionary decisions are subject to judicial review in the Federal and High Courts. However, the general principle that a judicial review court cannot substitute its decision for that under review applies. If a factual or discretionary decision is found to be infected by legal error, the court will remit the decision back to the relevant tribunal to be redecided. Therefore, in practice the merits review tribunals have the final say in the migration decision-making process on questions of fact and discretion, including how any relevant policy should be applied in the exercise of a discretion. In order to determine the correct and preferable decision in a particular case, the tribunals will often be required to also decide questions of law (especially to interpret provisions of the Act and Regulations). However, constitutional (separation of powers) principles limit the extent to which the tribunals can be given the power to make binding determinations of legal principles without Parliament having invalidly conferred the judicial power of the Commonwealth on them. However, these precise limits remain unclear. Click Here to contact us in confidence. A notification sent within Australia is taken to be received seven days after the date of the document, while notification sent to or from an address outside Australia is taken to be received 21 days after the date of the document. As the Migration Act refers to ‘the address at which the applicant intends to live while the application is being processed,’ the sending of a notice to a post box address will not bring the deeming provisions of the Migration Act into force. Decisions refusing protection visas to some applicants, including unauthorised maritime arrivals who entered Australia on or after 13 August 2012 as fast track reviewable decisions by the Immigration Assessment Authority (IAA) within the AAT. Offshore decisions refusing to grant visas where there is no criterion requiring nomination or sponsorship in that subclass are not reviewable. A decision that an application is not valid is not a decision to refuse to grant a visa and so is not reviewable. Decisions rejecting nominations or sponsorships are not reviewable. The Migration Act strictly defines the persons who can seek merits review of a migration decision. An applicant for review must be physically present in Australia when the application for review is made. For off-shore decisions, rights of review are confined to sponsors or nominators in Australia or Australian relatives of the visa applicant rather than being conferred on the applicant himself or herself. The applicant for review must also be a relative as the term is defined in the Regulations. If you have recently been refused a visa you should received a letter from the Department of Immigration stating the number of days you have to exercise your right for review. (iii) if the MRT-reviewable decision is covered by subsection 338(9) – the number of days prescribed, in respect of the kind of decision in question prescribed for the purposes of that subsection, after the notification of the decision. Time does not run for the purposes of review until a person is notified of a decision, although a failure to give notification of a decision does not affect the validity of the decision. The Tribunal has no jurisdiction to extend the time for application. For decisions refusing a bridging visa to a non-citizen who is in immigration detention because of that refusal or cancelling a bridging visa held by a non-citizen who is in immigration detention because of that cancellation – two working days after notification. 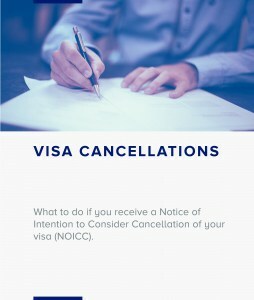 For decisions refusing a substantive visa where the applicant is in immigration detention or decisions cancelling a visa (other than a decision cancelling a bridging visa held by a non-citizen who is in immigration detention because of that cancellation) -two working days after notification; or if the applicant gives notice within those two working days that s/he intends to apply for review-five working days after that notice is given. The AATmay affirm, vary or set aside a decision under review or remit an application with directions that the applicant must be taken to have satisfied a specified criterion for the visa. The AAT has all the powers and discretions conferred on the person who made the decision under review. The MRT must not purport to make a decision not authorised by the Act or the Regulations. Prior to 1992, the AAT’s jurisdiction in relation to criminal deportation decisions was limited to affirming the decision or remitting it for reconsideration in accordance with recommendations. The AAT operates in a more adversarial fashion than the other specialist immigration Tribunals. The Minister for Immigration has the discretion to substitute a more favourable decision for that of the MRT and RRT. The minister however is under no duty to consider whether or not to exercise these discretions in particular cases, and these decisions are not subject to merits or judicial review, except by the High Court of Australia. An application fee of A$1,673 is payable in all cases, except when applying for review of a bridging visa decision (including any related decision to require a security bond) that resulted in a person being placed in immigration detention. Please note: Payment is not considered to have been made if a cheque is dishonored or a credit card payment is not approved. The fee may be reduced by 50% if we are satisfied that payment of the fee has caused, or is likely to cause, severe financial hardship to the review applicant. To request a fee reduction, you should lodge form Request for fee reduction with supporting evidence attached. The application fee (either the full or reduced amount) must be paid and a fee reduction application lodged before the deadline for lodging the application for review. We will refund 50% of the full application fee if you receive a favorable decision on any case. If we decide that an application is invalid, the entire fee paid will be refunded. The death of the review or visa applicant or a member of the visa applicant’s family unit. 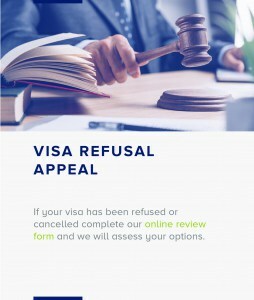 In relation to the review of a visa refusal decision, the visa applicant has been granted a visa of the same class (other than because of a reconsideration of the points score). In relation to a parent visa, the visa applicant has applied for another parent visa and wants a decision on the other parent visa. If a refund is to be made payable to a third party, the review applicant must provide written authorisation to us. No fee is payable at the time of lodging the application, however, if the application for review is not successful then the full fee of A$1,673 will be payable. If you are liable to pay the fee, an invoice will be sent by the Department of Immigration and Border Protection. You will be required to pay the fee within seven days of receiving this invoice. If you have any questions about the fee, you should contact the Department of Immigration and Border Protection after receiving the invoice. Contact details will be provided with the invoice. you cannot apply to have a decision reviewed by the AAT if the Minister for Immigration and Border Protection personally decides to refuse or cancel your visa under section 501 of the Migration Act 1958.